TERRE HAUTE, IN — The Obama administration is claiming economic progress, but not everyone is so sure our worst times are behind us. 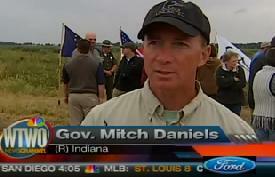 Indiana Governor Mitch Daniels said Sunday he remains concerned about the economy and says Washington needs to get it in gear. Earlier this week, there was good news on the housing market. Housing starts surged last month well beyond what economists had forecast, but it’s still not enough to stifle talk of a double-dip recession. Part of the governor’s plan is to continue a push to draw more people to the state. “Keeping taxes down, keeping Indiana an attractive place for the jobs that are being created is number one,” explained the governor. As Daniels continues his plans to jump-start the state’s still slumping economy, he’s calling on lawmakers in Washington to do their part. This, as the Obama administration admits progress is coming in slow increments. Another key to Daniel’s economic plan is finding a way to keep the state’s budget in the black without raising taxes for already struggling Hoosiers. It’s a task that gets more difficult the longer the job market remains fragile. TERRE HAUTE, IN – In part one of our special report on K-2, we introduced you to a new craze that is sweeping the nation; using a chemically altered herb to get high and in some states, like Indiana, it’s legal. Or is it? More on that in a moment. As I researched this story, I met some K-2 users who say they love the herb. One marijuana smoker even told me he prefers the high he gets off of K-2 but without knowing what company is manufacturing it and exactly what’s in it, health officials say the risk greatly outweighs the reward. On streets and in towns across Indiana, those who make the laws and those who enforce the laws are warning people about the effects of K-2. “It’s also more dangerous than marijuana apparently so I imagine it’s going to be vigorously pursued,” explains Gambill. And the warning from police: before you spend your money on the chemically altered herbs, know that it may already be illegal. So if it may already be illegal, why don’t the police arrest the users and the sellers? Some cops say, they don’t know if they can but they warn if you get caught smoking K-2, they will investigate it. But those who enjoy smoking K-2 are happy it’s so easy to get their hands on and they’re giving it rave reviews on the internet, where blog post after blog post pour in from people who’ve tried the synthetic marijuana; and who like it. But the easy access they welcome may not be around very long. Lawmakers in Indiana are already talking about actions they can take to make K-2 illegal in the next legislative session. This herb is sprayed with a chemical and there is not one source that can tell us what it actually is and while users may enjoy the high, without knowing what you’re putting in your body, it can be a dangerous gamble. It’s definitely something law enforcement and legislators are trying to get a better understanding of. Police and lawmakers in Indiana are struggling with how to handle a new craze; a legal way to get high. 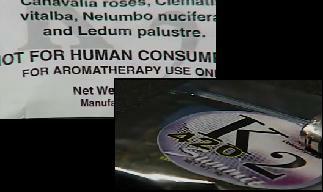 Law enforcement’s fight gets harder as a new herb’s popularity continues to spread. K-2 is a blend of herbs and chemicals that mimic the effects of marijuana but it’s so easy to get your hands on, all you have to do is go to your neighborhood gas station. It’s that easy access officials in Indiana fear, as more and more people start lighting up the so-called synthetic marijuana. At first glance, it looks like, smokes like and gets users high like marijuana. But it’s legal and easily available and it’s growing more popular each day. Opponents say there are more questions than answers. For one, no one really knows what’s in it. Police fear people will try the herbs because they are legal. But being legal doesn’t mean it doesn’t have side effects. “People expect this to mimic marijuana, but it’s sometimes 10 times more potent than marijuana,” says Gambill. With it’s affects possibly more potent than marijuana, why is it legal? For one, it says right on the label the product is not for consumption. Plus, Indiana lawmakers haven’t yet acted to make the chemically altered herbs illegal, at least not yet. But without more evidence that the legal weed contains something illegal, all law enforcement can do is investigate the craze and hope lawmakers don’t act too late. Illinois recently passed a law making using and selling K-2 illegal and while it appears to be legal in Indiana for the moment, some in law enforcement say, “not so fast.” It may be illegal already. More Tomorrow As I Conclude My Special Report: Inside The K-2 Craze. 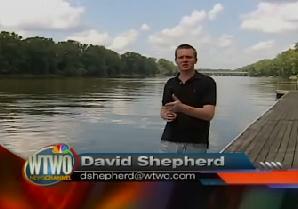 TERRE HAUTE, IN – It appears Asian Carp have invaded Valley waterways. Video shot by an amateur photographer and river enthusiast shows how incredible and dangerous these aquatic nuisances can be. Kearns’ video shows dozens of carp flying through the air, hitting the boat and members of his crew. While Kearns admits shooting these amazing images was fun, these fish can be very dangerous. As Kearns’ video spreads across the internet and TV, many are getting an idea of why wildlife experts didn’t want these fish here in the first place. For tour boat companies, business is booming. They say everyone wants to see the Asian Carp. But for those, like Kearns, who fish along the banks of the Wabash, an Asian Carp is far from what they want to see. The Carp isn’t just dangerous for those who like to relax on the open water. Kearns explains fish and wildlife can be affected as well. The Asian Carp has been cultivated in Chinese aquaculture for over a thousand years. But here in the United States, the Carp take over waterways, eating anything it can, and producing at a rate much higher than other fish.